March 4, 2014, 3:06 p.m.
That ambivalence, I’d wager, is a lot like the feeling some had in The New York Times’ newsroom when they realized the most popular Times story of 2013 was a dialect quiz made by an intern. Those reporters and editors get into the business to do certain kinds of work, but the factors driving today’s news web — the availability of analytics, the rise of social sharing, and what remains of the CPM-driven advertising model — mean it’s increasingly clear that popularity doesn’t always line up with the work you’d want mentioned in your bio. Ambivalence is not quite the right feeling. Maybe bemusement. The Travolta name generator is a delightful piece of work that brings pleasure to millions — literally millions — of readers. It’s fast, fun, and on the news, and I am unbelievably proud of the clever work that went into it, and glad for the joy it has brought so many readers. On the other hand, I have to giggle that this project is attracting millions of readers, and crushing stories about Ukraine or Obama under its boot. And on the third hand, one of the most popular Slate stories in the past six months before Travolta came along was Josh Levin’s The Welfare Queen, an 18,000-word masterpiece about the woman Ronald Reagan villainized for bilking the government, who turned out to be even more fascinating, and loathsome, than Reagan ever could have imagined. So our readers go low with us, and they go high with us, and, like Pharrell, we’re happy either way. Benton, Joshua. 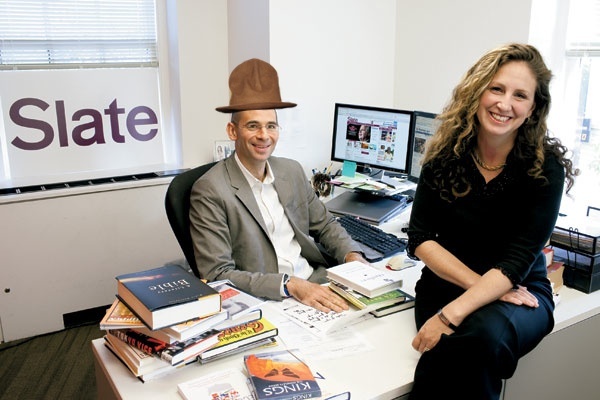 "On Adele Dazeem, Slate, and editorial ambivalence: “Our readers go low with us, and they go high with us”." Nieman Journalism Lab. Nieman Foundation for Journalism at Harvard, 4 Mar. 2014. Web. 20 Apr. 2019. Benton, Joshua. "On Adele Dazeem, Slate, and editorial ambivalence: “Our readers go low with us, and they go high with us”." Nieman Journalism Lab. Last modified March 4, 2014. Accessed April 20, 2019. https://www.niemanlab.org/2014/03/on-adele-dazeem-slate-and-editorial-ambivalence-our-readers-go-low-with-us-and-they-go-high-with-us/.